Looking for a garden buildings direct review? 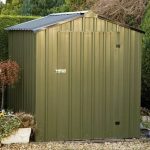 If so then you have come to the right place, WhatShed.co.uk have done an in-depth independent review of Garden Buildings Direct. Our goal is to help you find the best online retailer for your future purchase, in an attempt to do this we not only review the products but we also review to retailer. On this page you should find everything you could ever possibly want to know about Garden Buildings Direct. Garden Buildings Direct are a well established manufacturer and online retailer of garden buildings. This includes wooden sheds, metal sheds, plastic sheds, log cabins, summerhouses, childrens playhouses, garden storage and greenhouses. They are a long established online retailer with 10+ years of trading and a long list of satisfied customers. Low price of as Garden Buildings Direct would rather put it “grate quality at affordable prices” is the main mantra of this retailer. They also put a firm focus on “Delivery is FREE to the majority of mainland UK”. Overall our opinion of Garden Buildings Direct is they are a fantastic alternative to the more traditional offline retailer like B&Q etc. If you are looking for a Garden Buildings Direct Voucher or a Garden Buildings Direct Discount code then why don’t you check out our dedicated money saving page that we regularly update. When it comes to products, Gardens Buildings Direct have all you could possibly need. They have sheds, summerhouses, playhouses, greenhouses and pretty much anything that you would want as part of your garden. 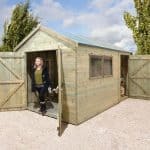 We really could not be any more impressed with the products that they have and we love how they have sheds and other structures not just for large gardens, but also for smaller ones, so if space in your garden is something of a premium, you will be very happy with their selection of smaller products. Garden Buildings Direct specialise in the BillyOh range of products and one of the things we love about this is that they have many styles of shed, bike store, greenhouse and so on, but most of these can be purchased in different sizes, so if you do see a shed with a design that you love then chances are they will have it in a size that will suit your needs. We feel that the prices are spot on and we love how most of their products come in what you would class as a basic form, but then they make it so you can add things like a better flooring, shelving, stronger roof, paint and other such extras. 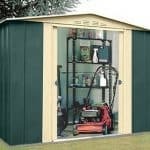 Of course this cannot be done for everything, but we feel that it makes it ideal for people of all budgets as those on a more tight budget can purchase a basic shed, whereas those with a little more money to play with can add a few extras and turn what was once something basic into something more high end. In general we feel that their pricing is great, especially for some of their larger and more impressive structures. 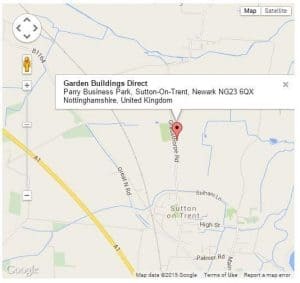 Garden Buildings Direct do a great job in making sure you have no trouble when navigating their site. To start with they have tabs across the top of the home page for things like summerhouses, sheds, greenhouses, playhouses and a few others as well. You can just click on one of these and then make your search a little more specific. For example if you click on sheds, you can then decide on metal or wood and other things like that. We really like how each product gives you all the extras and customisation options in an easy to understand manner, but this does make it a little bit more tempting to add some cool features to the product you were thinking of buying, but we really do not see that as a bad thing. Once you do find something that you like the look of, you will love the way that Garden Buildings Direct give you all of the information in an easy to understand way. 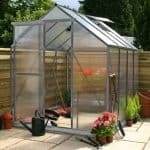 We are sure even someone purchasing their first shed or greenhouse would not find things confusing and know exactly what they are getting. They make it very easy to know how to get in touch with them and in general, we feel this is a site that should not cause you any problems. The only issue we see potentially happening is some people having, is the vast amount of choice being a little bit too overwhelming, but really when you consider that is the worst thing about the site, then it must be pretty good. What Are The People Saying About Garden Buildings Direct? Below you will find a list of all the additional resources that the WhatShed.co.uk team could find that allow independent reviews of Garden Buildings Direct online. If you are a customer then we would also really appreciate it if you could take the time to also leave a revive of the retailer on our site as well. All reviews are manually checked, 100% independent and genuinely do help other people decide if they want to use the retailer or not. Trust Pilot: If you are looking for the most comprehensive list of reviews available online for Garden Buildings Direct then you should check out Trust Pilot. With almost 2,000+ reviews on the company you should end up with a very good opinion after you read them. The Trust Pilot rating is 6.9 out of 10 with 52% of customers giving it a five star rating. Visit website and see reviews by clicking here. Review Center: With just under 200 reviews we feel the review centre are well worth checking out. There is a good mix of positive as well as a few negative reviews on here as well with some people having issues with the delivery times. Visit website and see reviews by clicking here. Ciao: With hardly any reviews on Garden Buildings Direct but still if you want to check them out then we feel it is worth doing as there is plenty of glowing reviews on here as well as some where the customers were not too happy. Visit website and see reviews by clicking here. Wikio: Wiko has hardly and reviews on Garden Buildings Direct but still if you want to check them out the link to the page is below. Visit website and see reviews by clicking here. In general Gardens Buildings Direct is a site that we really like. They have a great selection of products and we really love how most of the items in their BillyOh range can be purchased in all different kinds of sizes. We know that there are some complaints here and there, but for the most part we feel that they are doing a good job and hopefully the complaints that they have had will keep them on their toes. Cheap for a reason. Aftercare from a useless call centre in the Philipines. Shoddy product – warped, damp and broken panels. Be prepared to spend extra getting it up to standard and don’t expect any customer satisfaction from after-sales team. Guaranteed delivery slot of 6 am to 7 pm, nothing turned up. Chased by phone and not called back. Tweeted complaint was called and told delivery by 6pm the following day and asked to remove tweet! Nothing delivered and no call – no idea if i have been swindled or not. Good price, but what use is that if they cannot deliver. Not a good first impression! Hi Ben, thanks for the feedback. I hope it helps others make a decision on if they want to use this retailer. Ordered an 8×6 Garden. Made it clear to them that I needed a 23rd May delivery (on a number of occasions). Contacted Kybotech via phone on the morning of the 23rd, told that there was a part missing to delivery would be 7-10 days ( my current shed was chopped up at this point). Seriously out of pocket for the extra labour I had paid for to do this work, although the company were not interested in this as this isn’t covered in their ‘terms and conditions’. Company not willing to offer any compensation – indeed anything in respect of the problems they have caused. Many e-mails and calls exchanged offering little help. Have had to cancel this order. Bank Holiday now missed! DO NOT USE THIS COMPANY!!! I was told the shed was out for delivery but come 6pm nothing had arrived. I emailed and waited for a follow up apologising and explaining the situation, nothing arrived. I called to find out what was going on, only to be told it had been delivered and I should look about the house for an 11×9 shed, as if it might have gone unnoticed, or maybe it could have been hiding, who knows! They had to investigate and I was promised a call back the same day, no call came. I had to phone back at the end of the day, only to be told it wasn’t put on the lorry and the quickest they could get me it was in 7 days time, despite stating they offer a 48hr delivery service on their site, they certainly weren’t willing to go the extra mile to rectify the problem. I’ve now been left out of pocket because of their failings and the attitude I got said they really couldn’t care less. I’ve since had to cancel the order and will wait for a refund, hopefully that will be less painful, who knows. We ordered a playhouse for our 3 year olds birthday. We paid extra for delivery on a her birthday. The day before delivery we were told that they couldn’t deliver as promised and that we may get delivery a week or so later but they couldn’t be sure. Rang the number from the email correspondence and was surprised to reach a call centre in the far east. I thought they were based in Newark…. The review figures I have left are on the generous side. Terrible company, terrible customer care, and no product to review. I never leave reviews about products but after so much stress dealing with this company I feel I have to. If your product arrives without issue then I am sure they are great. However if you have an issue they have no actual customer support to speak of. MY husband has wasted two whole days, I have wasted hours and I have an upset child with no play house. Not sure if issue is with suppliers or the company but this is the worst service I have ever experienced. They just don’t care how much of your time they waste, what they tell you or how frustrated you are. Try a different company unless you are willing for your time to be wasted if things go wrong. Placed my order for a 10 x 8 summerhouse on the 5th June and was told 14 to 18 days delivery. When checking on my order online this had been changed to approx 21 days. After 25 days I had to make several calls and finished talking to someone from Philipines ? who after putting me on hold for 3 or 4 minutes then told me they were still waiting for parts to be made. After she read out these components it sounded like the product had not even been started. I was then told the summerhouse would be ready for delivery within 7 to 10 days. So if I receive this summerhouse 5 days after the 10th day I will have been waiting 5 weeks. For those of you thinking of buying from Garden Buildings Direct, don`t expect to good service. I have to be honest after reading the other reviews I was wondering oh no I not going to get good service. But I ordered a Billy Oh 5000 6 x 4 shed for delivery on the 14th September 2015 I was informed by email 3 times once to confirm my order.The second to explain my order was being despatched and the third to give me the delivery slot 8am til 1pm actually delivered on time at 9.30am. The shed is great and if you follow the instructions goes together with ease and is of great quality for the price. Thanks Kenny, I must admit that we are seeing a lot of good feedback recently. I believe that they have opened a new factory to deal with the increase in demand. Its looking like this increase in capacity is leading to a smoother delivery scheduled. Thanks for taking the time to leave a review, I am sure it will help others. 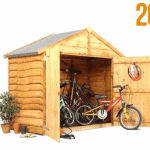 Brought a cycle storage shed in October.Ordering went fine and delivery on time. Unfortunately it all went wrong then when the floor base was the wrong size and you then have to deal with a call centre in the Far East which doesn’t appear to be able to deal with problems effectively.Eventually a new floor was delivered. Now come February I have problems with a leaking roof turning the shed mouldy.I have asked the customer service for new felt and roof panels.After sending numerous photos and going through the T&C I just keep going around in circles. I am now on my ninth email, call.For such a simple problem to fix their lack of care is infuriating. Basically their motto is to fob you off as much as they can.If you value customer service do not use! Play house delivered with missing parts. It’s taken me six weeks of phone calls and Emails. A total nightmare from start to finish. For what I paid for the play house it’s not worth the money,Cheap and nasty. customer service is in a far away land absolutely useless .DO NOT BUY FROM GARDEN BUILDINGS DIRECT!!. Garden Buildings Direct does price itself at the low end of the market and the product is what you would expect for the price. Positives are the wide range of products and ability to customise your order. The order arrives with comprehensive and easy to follow build instructions. Negatives are that the delivery was late, communication with the company was poor, the product was incomplete with parts broken, customer service was poor, they do not make an effort to resolve any issue you have after you have paid your money. Interestingly they are still having issues with opening new processing plants two years after you noted they were having the same issue. I note that over half the reviews on review centre are one star – even given the bias in reporting negative experience this is staggering. In summary – the sheds are cheap and if you are lucky then you won’t have any problems. If you do have any problems then you are stuffed. Thanks for the feedback Holly. Do not buy from this company. Wood is poor quality, playhouse leaked in and got soaked inside. Now damaged less then six months on. Customer service is shocking they don’t care about their customers. Avoid like the plague. Terrible customer service with an overseas call centre. They take your money and then don’t care, when my shed finally arrived it was a joke. Poor quality wood and parts missing. Look at all the reviews on Trust Pilot, there seems to be a format to the positive ones and all the negative ones get reported and removed by Garden Buildings Direct. Absolutely awful service! Will not recommend. Service is unacceptable! Awful company. Playhouse. Received last Friday!! Oh what a surprise, 3 parts missing. Called company Saturday and was told I would receive parts in 2-3 working days, email received that they would be delivered on Tuesday! Tuesday 5.30pm – nothing arrived! Called. Company, won’t receive products until Wednesday or Thursday!! Bearing in mind this is more than 2-3 days! !parts arrive Wednesday, what a bloody suprise the parts are wrong! Called company and asked to speak to a manager!! Surprisingly the manager is busy was told he would all back! 3 hours pass and no call! Fabulous customer care. Called company again, correct parts will be received in 2-3 days! Advised company that I need to get the parts by Friday. Get email today. Saying we won’t receive until Wednesday 17th!! This is nearly 2 weeks of waiting!! DO NOT BUY!! You have been warned! Worst online buying experience ever. If they could manage their deliveries as well as they can manipulate their online reviews, they’d be fabulous. We ordered a BillyOh Home Office on 23rd March. Half arrived 19th April (and to be fair, the driver was helpful and identified that about a third of the parts were missing). Another delivery arrived on 26th April, but only a couple of parts; we were still missing both side walls and plenty of other bits. After many calls to their useless Philippine call centre, we were promised the rest would arrive on 10th May. So we waited in all day, and nothing arrived. We were then promised delivery on Saturday 13th May. We waited in all day, having phoned and been told it was definitely on the van and we were the first drop. Guess what, nothing arrived. When we phoned them at 8pm, we were still told it would definitely be arriving that day ! We’ve got the chat log, and it reads like a comedy script. Their cancellation & refund policy seems over-complex and bureaucratic, designed to enable them to keep the money as long as possible. It is now nearly 7 weeks after ordering with no home office, so we plan to regain control of the situation by doing a credit card chargeback and reporting them to Trading Standards. Avoid this company unless you like spending hours on the phone to a call centre and more hours looking out of a window waiting with decreasing hope for a van which will never arrive ! STAY AWAY FROM THIS COMPANY: Ordered a summer house, told it would arrive 10 -4pm on the morning had an email saying it would arrive 4pm -11pm, deliver is down as 6am – 6pm. Told during the day it would arrive at 6.30…nothing…..7.30…. nothing then I had a call the van had broken down, told it would be 9.30, it arrived at 10.50pm. 1 guy on his own so we gave him a hand to off load. One of the main sides was missing. As we have people helping us put it up this weekend I need the side panel, I have been told there is nothing they can do until 3 – 5 days. I have cancelled the order and told them to issue a full refund and collect the Summer house which is very flimsy, I will also be contacting my credit card company to get payment stopped and getting in touch with Trading Standards (luckily my husband knows the main guy who heads it up). I should have known, in all my years I have learnt you get what you pay for. Quality Log Cabins are £3.5k, if you see one for £1k you should know better. This is the single worst product I HAVE EVER BOUGHT. The timber arrives in 200+ pieces. It is untreated. You have to set up a production line to apply 2 coats of preserve, drying in between and 2 coats varnish or paint later. That took us nearly 6 weeks!!! We had to get pallets to rest drying timbers on, saw horses to sit the timbers on while applying, removal blankets to cover the garage floor and driveway to stop the preserve/laquer staining the floors, bike covers to move bicycles out of the garage to achieve enough room to treat, lay out while drying and then store treated timbers until the whole thing was finished. If you live in a house with no garage and no driveway, I have no idea how you would do this?? It is in tiny, tiny letters on the selling website, that the timbers are untreated. It was the delivery driver who really explained that to us. 33% of the parts were missing. Of the 66% we did have, 25% were damaged or incorrectly produced. We were provided with the wrong instructions and wrong parts list (we didn’t know that until after we started the build and phoned for missing parts. They emailed us a parts list which was completely different to the one we received with the delivery. The missing parts arrived 10 days later, then they have to be treated, but 50% of the missing parts were missing!! I worked out that I could buy the missing structural pices from the local timber merchants and the rest were all fascia pieces, so we could still finish the build. 2 weeks on I still have no fascia pieces and cannot get any response from GBD. We decided on clear laquer, as we wanted the light timber look. The 2 batches of timber received, plus the ones we sourced locally, are all different colours, it looks bloody awful. The first delivery arrived 15th April and we still have parts missing. The quality of timber is dreadful, its thin and flimsy with incorrect cut outs on view on wrongly made boards. With associated costs, varnish, brushes, local timber etc, we have spent an additional £500 finishing a 10×8 cabin that cost £1000. It’s not finished yet and it looks an eyesore. I haven’t decided yet whether to paint it and live with it or set alight to it. If you don’t have the £3.5k for a proper log cabin, please, please., please, either save until you do, or just buy a tried and trusted shed from your local timber merchant. NEVER buy from these people. They are, by some distance, the overall worst seller I have ever had the misfortune to buy from. Totally my fault, I should have known. But in fairness, even at my most cynical, I couldn’t have guessed this. Local companies will deliver and BUILD better sheds cheaper. I never leave reviews but this was my worst consumer experience in 40years!!!!!! Nice site! This review is is a bit long winded and from my personal experiences through gardenbuildingsdirect. It is not a review of the overall quality of the companies; however, the sheds they (billyoh, gardenbuildingsdirect and kybotech.) provide are, in my opinion, not the quality that they appear to be. I wasn’t after a furniture finish, but I was expecting more than I got. After contacting GBD they have offered to replace any parts that are considerably damaged, but the general quality annoyed me. GBD state on their website that they have a 14 day money back guarantee; however, what they fail to include on that returns page is that if it is not damaged and you choose to return your items, you will be paying £0.30/kg, which for my 7×7 shed costs around £58. It’s at their discretion if they accept it as damaged and they include this information in an order confirmation email that you receive after you have paid for your items. If you’re like me and don’t expect a confirmation of your order to contain something other than a receipt, think again. There’s no way I was paying £58 and a possible £50 on top for returns so I decided to put it up. It took 8 hours just to erect the bloody thing as I had to take it down when partially completed to trim and retreat all the edges of the panels down so that everything actually fit together, as best as it could anyway as the framing was severely warped in places. At one point, I honestly felt like ripping it all apart as whoever assembled it didn’t even tap the panels down to engage the tongue and groove properly. Today I’m going to fill all the holes, repair the split boards and try to get the best fit on the warped doors I can. My advice is that if you simply want a box for your garden, go for it; however, if you’re wanting and expecting something of quality and security, avoid them completely. BTW, places like trust pilot remove some negative reviews for absolutely zero reasons. I’ve had several of my reviews on there be removed under some rule of theirs, so there have possibly plenty more negative reviews of their products. ordered a shed 08.08.17 and requested a Friday 18.08.17 delivery. I received an order acknowledgement with a delivery for 18.08.17. I received an email at 8 pm 15.08.17, informing me that they were now delivering 16.08.17 between 06.00 am and 12.00 pm. I called, e-mailed and tweeted the company explaining I had taken 18.08.17 as a day off, and I was going to work 16.08.17 and there was no one at home to receive the shed. Garden Building Direct delivered anyway and left the shed in the front garden all day. I live in South Croydon, things go missing. Garden Building Services Direct have a call centre in the Philipines and ignore all emails, tweets, even to the Help twitter site and messages to their facebook site. They have no interest in talking to you directly, the call centre is of no help at all. Shed was delivered with a damaged roof initially, we had the replacement sent out for next day delivery after fighting for it and my fiancé took the day off work on the Saturday to build the shed. We managed to put the base and walls up then came to put the roof on, only to find out that two of the panels for the roof were not the correct ones and were both too narrow and too short to fit on the 10×6 shed. There is a storm forecast for this week and we have no roof on the shed, our mechanical and electrical equipment is now at risk of damage and the flooring we have chosen to put in the shed and would be perfectly fine in a shed with a roof is now at risk of severe damage if it rains and still this company is making excuses as to why they can’t send out the correct panels next day despite them having done it once and there being a lot of same day couriers about. The customer service are obviously just reading through a script and trying to get them to understand the severity of the issue is one of the hardest things I have done for a while. DO NOT RISK THIS HEADACHE!!!! Even trying to get through the customer service is a nightmare, if you choose the wrong phone option it hangs up on you!!! Appalling customer service. I’d advise pay a little more a company who placed more value in the customer. Order was taken over the phone, the person taking my sale was very helpful. Then when delivery was due it transpired my delivery address was taken wrong and attempted delivery to my billing address. Actually contacting customer services to rectify the problem was hard work, call the customer service number and any option selected takes you to an automated pre set response, I eventually just called the sales line and got them to put me through. Where someone from customer service did help me pretty quickly to be fair, but getting through was made far too hard!! Then when it eventually did arrive the painted wall add on product turned out to be a tin of paint, and the add on product padlock was incredibly poor quality for the price tag. Also some of the wood was cut poorly, and one part was heavily bowed, I cudnt wait to replace as I had it half built so clammed and heavily screwed it in (any one day it’s little carpentry knowledge would struggle). When I flagged the miss selling of the paint over the phone they wanted me to pay for return claiming it’s made clear they don’t pre paint, which they do on. The website, however I was a phone order. I gave up with the back and forth on it as they are clearly a company with no pride in customer saticifaction, and mark up on add on products is probably hugely profitable to them anyway. All being said a massive shame, had their customer service been much better I may have been more satisfied with the ok product. Pay a bit more and go with a company carrying a better reputation for customer service. I was excited when I stumbled across this company however the product isn’t as described as all panels are either warped or misshaped. I though get this was due to it being a natural material but made putting together interesting. Plus they avoid certain elements such as the felt roof looking very poor and the treated floor caving in!? When I ordered My workshop, I chose a delivery date of the 20th, on the 15th (Sunday night) I received a text to say my delivery would be the 16th, on logging into my account the notification told me I was now unable to change this, I msg’d your customer services & was instructed i could refuse the delivery if i was unable to take it, at this stage we had not laid the base for our workshop as we were expecting it on the 20th & i was due to be out most if not all of the 16th. On the morning of the 16th I received a2nd msg saying I had refused delivery, I had not, someone at GBD had done this… I spent the next hour trying to get hold of an operator to find out what was happening, the phone options system gives people the run around, deliberately ending calls directing people to the website, I had to chose completely irreverent options in order to get through to an operator…that operator then had to transfer me to different departments, I will be reporting this to trading standards as you don’t make it easy for anyone to get hold of you & your operators from the non UK based call center just read from scripts giving standard replies, there was no real help to a problem. When i did get through I spoke to a operator with basic English skills, it took far too long to establish my delivery should have been on the 20th, as far as she was concerned I had refused the delivery, there had not been any delivery… when I requested the delivery to be put back on the 20th she tried to charge me £30, I had already requested this date with my order, I was not going to pay again for the delivery date I had already selected. I had to refuse to pay this multiple times, no reason or apology was given i was told if i did not want to pay i would receive the shed on the next available day but she did not know when that would be. what is the point of picking & charging clients for delivery dates if you are going to completely ignore them? Onto the workshop building, quite frankly I’m amazed i could put it together, the quality of construction is far worse then the quality of the materials which i would classed as damp fire wood, i have assembled 4 sheds in my life time & have been a wood worker for 14 years, it would have been quicker & easier to build my own from scratch, it would have been from far better materials for the cost. I ordered a pre made building as i have limited time, the idea was it would be the quicker option, this was not the case in the end. Non of the panels were square, they were impossible to get them to line up correctly, they cant have been made with templates or any tooling that allows consistency, sides cut shot, T&G cut long, I had to half disassemble 3 of them just to get it something like, I would have taken more apart but they start to disintegrate…. I’m very glad i didn’t order a floor as the ones included or could be upgraded to were incredibly thin, we used 18mm OSB on 3.2’s instead, this was cut to size and square having been cut on our panel saw in the joinery workshop were I work… the workshop would not sit on it, not only was it out of square no matter what we did, the dimensions were off we had to re make it to get it together… the roof was very much the same, when all put together there were gaps & holes in the panels i could put 2-3 fingers through. The contents of the bags, the wood & screws were all soaked, the bags were full of water, our instructions were soaking wet we had to dry them out to use them, parts were rusting & again the quality of the wood & timber is all shocking, even pilot drilling everything didn’t stop splits, its just poor stuff. about 30% of the roof T&G has splits in it before we even came to used them, we had to glue them back together, given how wet the wood is it would not surprise me if shrinkage does not cause us further roof problems down the line. Finally we got it together something like, a few hand size gaps in sections & corners as the frames were so out of square or were just so warped, several times during the build i had considered stopping, returning it … but the simple fact is by the time we had realized how bad it was it was all unpacked and in progress, access was limited where were were putting it up & it was just as big a job to take it down & re pack it as it was to keep going… it had taken half a day to go through all the parts & another half day to get 4 walls standing . The next issue i discovered was when i walked into the shed for the first time after putting the roof trusses in, I’m 6ft tall, and could only just stand in between them, the listing states that the shed is 1.76 to the eves at the shallowest part and 2.06m to the ridge, its advertised as EXTRA TALL… this is complete garbage & false advertising… mine was 1.69 to the eves, i could not move around in this workshop without stooping or receiving a concussion every time I moved sideways… in the end i had to raise the roof another 4″ to make it just usable. id have raised it more but i was now using materials i had bought for other tasks to make my purchase fit for use, this product as it stands is not suitable for anything but a mediocre storage shed, you could do no work in it unless you are about 5 foot 5. After a further 3 days of wrestling with it, and modifying repairing it i have now got a workshop that’s usable, its cost me an additional £100 or so in materials & way too much time, and I’m now able to line it out with 18mm OSB, all in all its been an over priced, “low cost” workshop that i would have been better off buying a more expensive shed from another UK manufacturer (these are not made in the UK) it would have saved me time & money for a better product that fits together, I’m kicking myself about that now, i will be logging complaints with Trading standards and putting up this review elsewhere as i don’t want anyone else to suffer the shoddy service & appalling product i have had to make right. they really are not fit for Billy OH & Garden buildings direct are selling them as. We have suffered a number of problems with our BillyOh 5000 10×10 summerhouse for £1089. Our first email has so far been ignored. 1. The size being wrongly stated. The building had specifications for the floor size. We built our floor accordingly as we wanted a stronger floor. However, the summerhouse turned out to be much smaller than described. Instead of 10×10 it was 9’8” x 9’11 external size. This meant it would not drop over the edge of the flooring. We were required to dismantle part of the building in order to reduce the size of the flooring. This caused a substantial amount of time wasted and inconvenience. 2. The purlin/truss pack was missing. I was required to drive twice 21 miles to my nearest timber stockists to purchase suitable replacements. Each trip taking 45 minutes, but better than waiting any number of days waiting for them to send. 3. Many of the tongue and groove panels were very poorly made. Some with one nail, others with three nails. 4. The facia strips were too short. 5. The cloaking strips were too short (although from their images) it seems they are happy for them not to cloak the full length of the panel joints. 6. The roofing felt had holes and tears on the first 2 feet of the roll. The roll subsequently being too short to complete the job. 7. There are a number of small splits and other small areas of damage, which their descriptions attempt to suggest are perfectly ok. I feel it simply indicates poor quality shoddy goods with little care for quality control. 8. Other minor irritations include all the screws and nails etc dumped into one pack. Stock numbers stapled to each panel etc. Causing bothersome additional effort in picking and preparing prior to assembly. The instructions are written and illustrated on cheap photocopy sheets and are too small to be as clear as they could have been if they had been more carefully produced. All in all, I think we have bought a cheap shoddy shed and are disappointed with it’s tackiness. I needed two sheds and will not be buying the second one from them. The business will be placed with one of their competitors. Garden Buildings Direct have lost another sale of approx £2500. Serves them right. How can you rate this shocking company 8/10? Have you read the reviews? Absolutely appalling to deal with, flimsy cheap wood that is not fit for purpose. I’m 2.5k down with a summerhouse and shed that has been up for a week and is leaking bowed and the worst quality. Don’t even get me started on their call centre based in the Philippines. Please please rethink your guidance as you are helping people get ripped off with your inaccurate assessment of this absolutely vile companyou. Avoid avoid avoid! Hi Christina, We are due to do a mystery shop this year and will be updating the review accordingly.